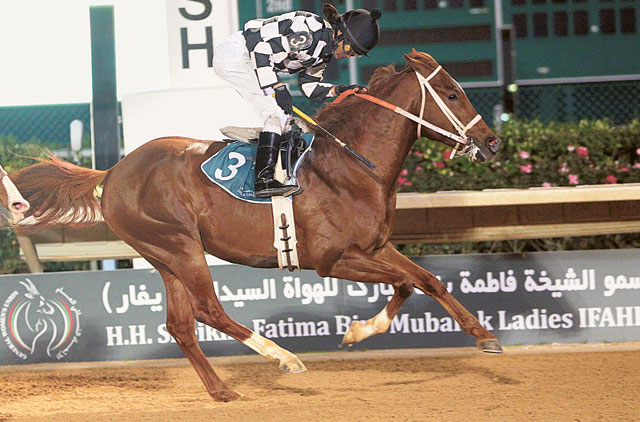 Houston: TM Junior Johnson became yet another star sired by Burning Sand when he won the Shaikh Zayed Bin Sultan Al Nahyan Cup — a Grade 3 race organised by the Shaikh Mansour Bin Zayed Al Nahyan Global Arabian Flat Racing Festival — here on Saturday night. The four-year-old was impressive as he almost made it a start-to-finish affair, with Jose Figueroa guiding the rising star home with ease. In second place was 60-1 long shot Status Symbol, while Mohammad Faisal Al Hammadi's Its Far From Over finished third, ahead of last year's winner of this race, Grilla. The Texas-bred colt under Figueroa had earlier won the $30,000 (Dh110,160) Texas Shootout and, with Saturday's win, he joined his full brother TM Fred Texas, who had won the Shaikh Zayed Bin Sultan Al Nahyan Cup in Delaware last year and prior to that had won the UAE President's Cup in Kentucky. "I was very confident he would run a great race," said owner-breeder Toad Moak. "To win with such good horses like Grilla and Rich Frynchman running is credit to his potential." While Rich Frynchman finished sixth, Grilla's trainer Bill Waldron said his horse was bumped early and that prevented the front-running star from finishing on top. Omar Al Shamsi, deputy chief of mission at the UAE Embassy in the US; Lara Sawaya, Director of the Shaikh Mansour Bin Zayed Al Nahyan Global Arabian Flat Racing Festival; Abdul Mohsin Al Dossary, assistant undersecretary of sports at the General Authority of Youth and Sports Welfare; Talal Al Hashmi of the Abu Dhabi Sports Council; Adnan Sultan Al Nuaimi, director general of the Abu Dhabi Equestrian Club; Ali Mousa Al Khamiri and Patrick Buckley of Abu Dhabi Equestrian Club; and Stephen Bowey of Invest AD, along with US officials, attended the prize distribution and gave away the trophies. "We are glad that such large numbers turned out and cheered for the two Arabian races that we staged here tonight," Sawaya said. "We have another great night ahead when we stage the 2012 Shaikh Mansour Bin Zayed Al Nahyan Global Arabian Flat Racing Festival Darley Awards and The Shaikha Fatima Bint Mubarak Darley Award here in Houston tomorrow [Monday] night."